The Quarry Chapel is available for weddings and celebrations of any type—from secular to religious. Our beautiful venue seats 75-80 in pews. Some couples have opted to open the Chapel doors and utilize rental chairs for overflow seating. Our rental fee includes use of the Chapel for a rehearsal the day prior to your event. If you have any questions or would like to schedule a tour, please contact us at info@quarrychapel.com. Completed rental agreements and payment can be mailed to PO Box 849, Gambier OH 43022. Winter weddings can be beautiful at the Chapel, but do present some challenges. Please contact us for more information if you are planning a wedding between November and April. More information is also provided below. Book your wedding at the Quarry Chapel now! 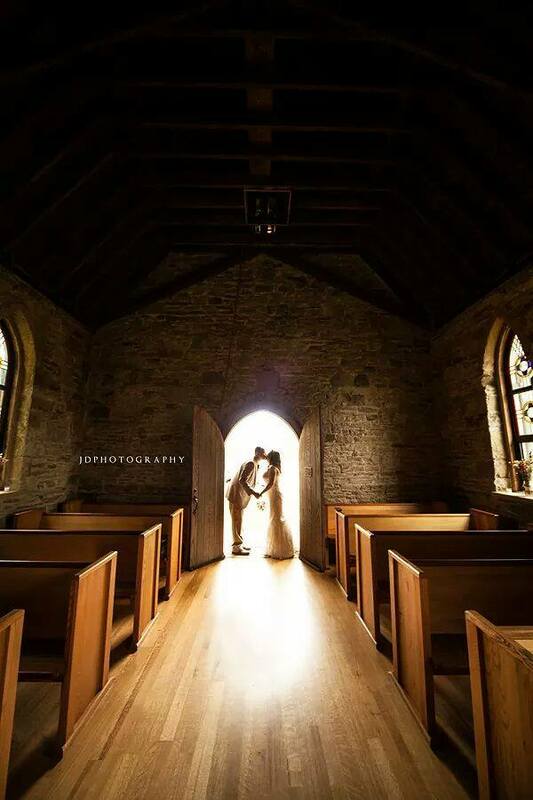 A wedding at Quarry Chapel in the winter can be beautiful, and we have hosted many weddings in the winter months. However, there are some challenges. Here are some things to consider before making a booking for November through March or even April. Quarry Chapel is restored but not modernized. There is no heat except for two patio heaters, very limited electric outlets, very little artificial lighting, and no running water. The only toilet facility is a port-a-john in the rear parking area. Because the chapel is not heated, it can be very, very cold. Those thick stone walls hold the cold, and it can be much colder inside the chapel than outside. You can mitigate this to some extent by renting a portable propane heater and running it for a few hours before the ceremony. Use of our patio heaters or any heater you rent must be supervised by an adult while in use. But, we cannot emphasize enough that it can be very, very cold inside the chapel. You and your guests will enter the chapel by walking across the grass. The lawn can be very soft, muddy, and/or snow-covered. This can be an issue for you and your guests’ shoes and dresses. In the winter, parking is limited to the stone parking lots in front of and to the rear of the chapel. About 20 cars can be accommodated. Parking is not permitted on either Quarry Chapel Road or Monroe Mills Road. If you require more parking, you will need to arrange off-site parking and shuttle transportation. We can give you some suggestions for this. Generally there is ample parking at Quarry Chapel. There are two stone-covered parking lots that can accommodate a total of about 20 cars. The first lot is on Quarry Chapel Road in front of the chapel. The second lot is behind the chapel, accessible from Monroe Mills Road. Additionally, head-in angle parking is permitted on the chapel grass adjoining Monroe Mills Road. The property owner opposite the chapel on Quarry Chapel Road permits parking on the grass at the front of his field. Parking is not permitted at any other place on Quarry Chapel Road. Parking is not permitted at all on Monroe Mills Road. From November to the end of March or even April, there can be bad weather in central Ohio. The grassy area and the field can be soft, wet, and/or snow-covered. Therefore, they cannot be used for parking. During this period, if you need to accommodate more than 20 cars, alternate arrangements need to be made for parking. Guests meet at a central location and form car pools. See below for suggested locations near the chapel. Guests meet at central location and are taken by shuttle to and from the chapel. Such shuttle could be anything from private cars to a bus. The shuttle vehicle(s) can be staged off-site and return for pick-up at a set time. Gambier Community Center, 115 Meadow Lane, Gambier, OH 43022,1.7 miles from the chapel, about a 5-minute drive.There is paved parking for about 30 cars in the lots by the south side and rear of the center. The center adjoins the village park and ball fields, so many parking spaces may be taken by park visitors. Just to the south of paved parking is another stone-covered parking area. It can accommodate another 20 cars. Again, some of these spaces may already be occupied. Please call the village office at the Community Center to discuss use of these lots, and whether or not they may be cleared of snow. Village phone number: 740-427-2671, M-F, 8 am – 4:30 pm. Your church’s or other group’s bus. Knox Area Transit, 25 Columbus Road, Mount Vernon, OH 43050, phone number 740-392-7433, M-F, 6 am – 7 pm. As of January, 2019, the charge is $33.04 per bus per hour. Bus holds 18 persons and is handicapped accessible. Eagle Rock Tours, 118 N. Main Street, Fredericktown, OH 43019, phone number 740-694-1673, M-F, 9:30 am – 4:30 pm.